All of our hand made dog bracelets consist of each link carved, molds made, and hand casted. All links and other parts are then individually assembled and final polished, becoming the finished high-quality jewelry you see above and on our other bracelet pages. 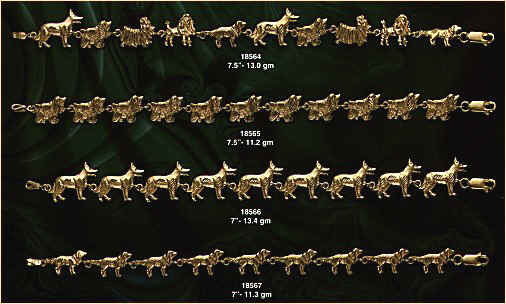 On this page we have four individualized dog bracelets, all 7" or 7.5" in length, and ranging from 11.2 grams to 13.4 grams. All bracelets have lobster safety clasps.